One of the things I strive for with this blog and anything else I write for public consumption is journalistic integrity. With respect to beer, I refuse to simply parrot what the various breweries, pubs and retailers. I collect information from the appropriate sources and interject my own thoughts as I write. I followed that course when I put together the post on the Return of Workhorse at Laurelwood. I first reported the official reason why Workhorse was taken out of production: a shortage of hops. That's the information they gave me. I then provided a personal interpretation of why Workhorse was taken out of production: to make way for Gearhead as their standard IPA, with an imperial version of Workhorse to be released soon thereafter. My interpretation was not well-received by Laurelwood brass. It's not hard to understand why. A lot of people were unhappy about the demise of Workhorse and many of them didn't believe the official explanation. I was tossing gasoline on the fire. You get the drift. In the spirit of fair play and good beer, I spent some time talking to Laurelwood brewmaster, Vasili Gletsos, yesterday. I had not met him before. We spent an hour or so bouncing all kinds of beer thoughts around. Vasili is a great guy. They're lucky to have him at Laurelwood and I suspect he will do great things there. Although Laurelwood considered tweaking the Workhorse recipe and releasing it as an imperial IPA, they eventually decided against the idea. Plans change all the time, Vasili said. There are no plans to release an imperial version of Workhorse this year. An imperial version may happen at some point, but the timeline is uncertain.When it happens, Imperial Workhorse will likely be part of their specialty series, with availability limited to select bottleshops. Gearhead is Laurelwood's standard IPA going forward, widely available on draft and in bottles at grocery stores, bottleshops, etc. The A-Z IPA program was never intended to be lengthy. As Workhorse was running out last summer/fall, Vasili launched the A-Z program and named the first few beers after racehorses...Aftershock, Best Bet and C-Biscuit. The "D"-beer wound up being Gearhead, which they decided to launch to replace of Workhorse, and the A-Z program was tabled. A little off the beaten path, Vasili said making less Workhorse has freed up brewing capacity and given them more room to experiment with new ideas. He hopes to use some of that production capacity to produce a lager, with a probable summer release. So there you have it. My supposition that Workhorse was taken out of production so they could easily release Gearhead and later launch Imperial Workhorse over the top appears to have been mistaken. Their plans for Imperial Workhorse are too uncertain to suggest that strategic course. As for the A-Z program, the information I was given by a Laurelwood employee last summer was incorrect. Vasili had only recently joined the brewery at that time. He says they are working to improve communication between the brewhouse and the pub. While I'm (sorta) on the subject of Workhorse, there are a growing number of beers out there that offer similar hops character. This surely has something to do with the fact that the hophead pallet increasingly seeks IPAs that feature piney, citrus, grapefruit notes in flavor and aroma. 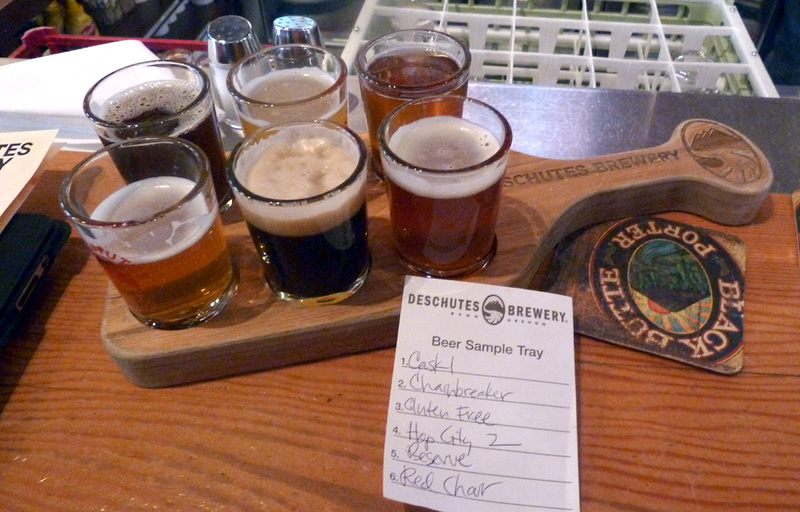 On a quick lunch outing today, I tasted an IPA that reminded me a lot of Workhorse The beer is Deschutes Hop City 2. It's one of their special selections at the Portland pub and they're calling it an experimental IPA. It has 95 IBUs and 9% ABV. Excellent lunch numbers, eh? More importantly for hopheads, Hop City 2 uses nine hop varieties. It features the same kinds of citrus, pine and grapefruit notes that in my mind make Workhorse so popular. Hop City 2 also reminds me Boneyard RPM. Workhorse, RPM and Hop City 2 make a nice trio, despite Hop City 2's higher ABV. Round 'em up! There was another beer on the taster tray that deserves mention. 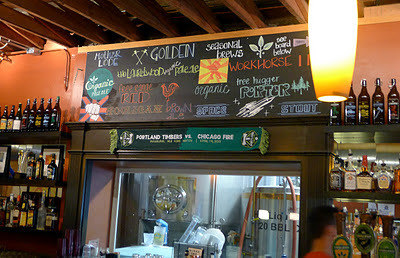 In the photo above, it's the beer to the right of Hop City 2. This is a blended beer from their Reserve stock. They evidently blended two parts Black Butte XXII with one part of what he referred to as a "house sour." No matter. This beer has a solid backbone, rich chocolate notes, and is wrapped in a mildly sour presentation. Really terrific job, Deschutes!